For many years, jerseys for sports teams were pretty simple… they had a white one and a coloured one and was usually limited to the team name or a logo. Then somewhere along the hippie artsy-fartsy crowd decided that the existing jerseys were too plain or lacked feng shui or whatever it is those beatniks call it and began coming up with new designs. 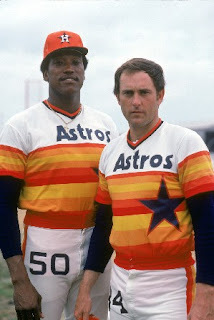 Then the marketing crowd came along and realized just how much potential money could be made off these hippies and ever since there has been a never ending stream of new jersey designs. Now many of these new designs are successful but as you’ll see below, many of them end up being massive failures. **Anyone else think the white guy looks kinda like Ricky Ray? y you could have at least gone with a more publicly recognized bear such as Winnie the Pooh, Baloo or at the very least put a forest ranger’s hat on him to make it look more like Smokey. It honestly looks like they ran out of money for equipment and were forced to decorate a set of plain black jerseys in coordinating lines of duct tape. 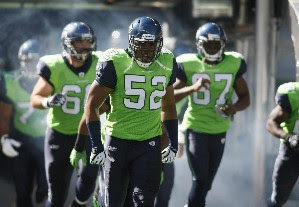 Apparently Seattle didn’t get the memo that the “Everything automatically becomes cooler with neon green” phase died back in the early 90s. 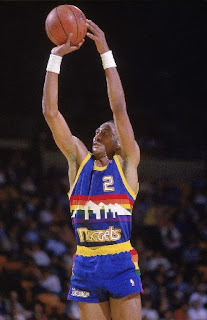 It’s fitting that Denver is know as the mile-high city since clearly whoever designed this jersey was also extremely high. I’m shocked that the “Joseph and the Amazing Technicolor Dream Coat” look never caught on. 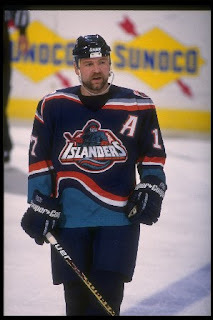 The only explanation I can think for this jersey is that Captain Highliner secretly cut a sponsorship deal with the Islanders. 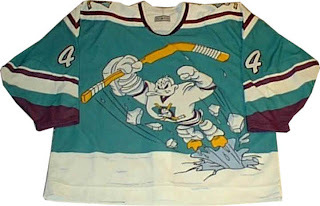 A jersey such as this is what happens when you base a professional hockey franchise on an Emilio Estevez movie, create a spin-off cartoon series based on that hockey team and prominently feature a character from that cartoon series on the hockey team’s alternate jersey. It’s a wonder more teams haven’t followed suit. Marketing lesson #1 – In a town notorious for the toughness and aggressiveness of its sports teams and its fans, a delicate blend of pastel colours is likely not going to be well received. Marketing lesson #2 - Logos that look suspiciously like a uterus will likely end up being huge failures. 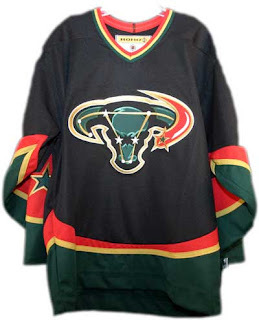 Look I’m a Habs fan and even I have to admit that these were the worst jerseys I have ever seen. 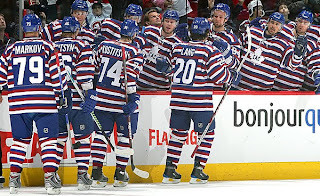 They look more like audition for Where’s Waldo gone wrong or “Wear Your Pyjamas To Work Day” than the most storied franchise in hockey history. 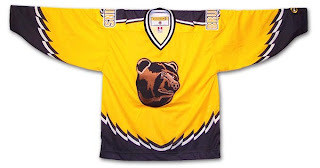 What about "The Burger King" jersey that the LA Kings wore in the 95/96 season? That thing was hideous. Wow I'd completely forgotten about those. What were they thinking? Bonus points for including 2 bad jerseys in the same youtube video. Thank you. I wasn't sure if people would notice the hideous Ducks jersey, what with that stupid thing they were forcing Gretzky to wear. 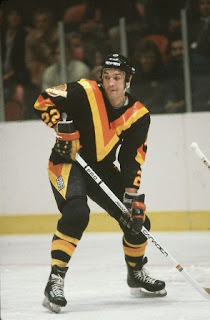 IIRC, the Canucks came out with a pink coloured third jersey one year. This is the Canucks one you are thinking of. I don't mind it. It's not as bad as all of these other ones are.